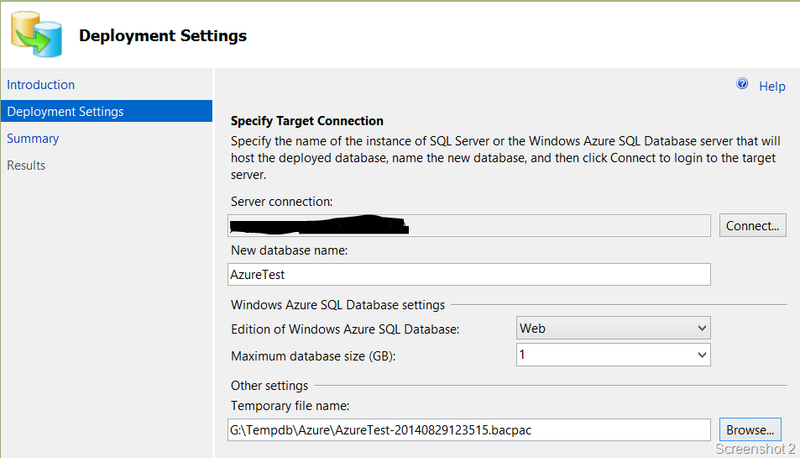 During the last week of August, I had blogged about how to get your on-premise database to your SQL Server instance running on an Azure virtual machine. I had run into a few issues while trying to run the wizard provided by Management Studio. Failed to locate a SQL Server of version 12.0.2000 or later installed on the remote machine. Please verify that a SQL Server of the same or higher version than the source SQL Server is installed on the remote machine. The above error is self-explanatory. There is a requirement that the source database engine version be lower or equal to the version of the SQL Server instance running on Azure. Eg. You cannot deploy a database from a SQL Server 2014 instance to a SQL Server 2012 instance running on an Azure VM. The Cloud Adapter port configuration is not valid. Verify the virtual machine endpoint configurations. The next issue could be with permissions/authentication or it might not be as easy as it seems. Cloud Adapter operation failed due to invalid authentication. Verify the virtual machine name, user name, and password. So the first thing to check if you have the correct account name and password. If it is due to an authentication error, then the application event log of the Azure Virtual Machine will show the following error with the source as SQL Server Cloud Adapter service as shown in Screenshot 2. The text of the error message is mentioned below. at Microsoft.SqlServer.Management.CloudAdapter.CloudAdapter.GetSqlInstances(String username, String password). Inner Exception: Invalid namespace . If you are not sure if you have the WMI provider, then look for the file “C:\Program Files (x86)\Microsoft SQL Server\120\Shared\sqlmgmproviderxpsp2up.mof“. This is the SQL Server 2014 MOF file. Another way to test if the WMI provider is working without running the wizard every time and have it fail is to run the PowerShell commands below on your Azure Virtual Machine. This script will tell you where the instance enumeration being performed by the deployment wizard will work or fail. This post was intended to document that common issues that you might run into while deploying a database from an on-premise SQL Server instance to a SQL Server instance running on an Azure Virtual Machine. The Cloud Adapter is a stateless, synchronous service that receives messages from the on-premise instance of SQL Server. 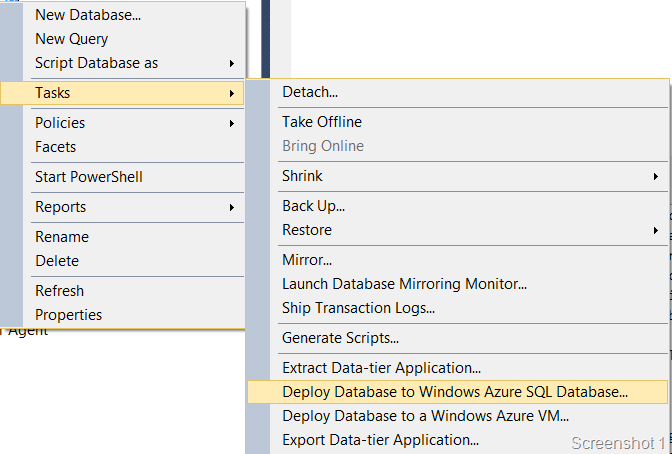 This service is required when you are deploying a database from your on-premise SQL Server instance to a SQL Server deployed on an Azure Virtual Machine. Cloud Adapter is supported with SQL Server 2012 and higher. On SQL Server 2012, the Cloud Adapter for SQL Server requires SQL Management Objects. For your SQL Server 2012 installation, you will need the SQL Server Cloud Adapter to be installed. This is available for download from the SQL Server 2014 Feature Pack. The filename that you need to download is SqlCloudAdapter.msi. Service cannot be started. System.IO.FileNotFoundException: Could not load file or assembly ‘Microsoft.SqlServer.SqlEnum, Version=12.0.0.0, Culture=neutral, PublicKeyToken=89845dcd8080cc91’ or one of its dependencies. The system cannot find the file specified. The above error message clearly states that the version number that the installer is looking for is SQL Server 2014 i.e. version = 12.0.0.0. You can install this assembly when Microsoft® SQL Server® 2014 Shared Management Objects (SharedManagementObjects.msi) is installed from SQL Server 2014 Feature Pack.